Office fitout consisting of Custom made Reception Counter, 2-tone Filing Cabinets, Shelving and a Existing Boardroom table using Black leather Cogra chairs. Custom made corner workstations and divider screens to accommodate 120 staff at the Gold Coast Bulliten's Southport offices. 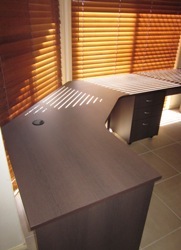 Custom designed and fitted Workcentre and Shelving units. Manufactured from laminex Prestige Walnut Pre-coated board. The Workcentre accommodates 2 people along with filing and overhead storage. The Wall unit accommodates both filing and storage. Tulip chocolate side chairs with 1200 x 800 Travertine Werzalit tops on Roma twin table frames.